In our last lesson we learned about dir, which in addition to being an involuntary exclamation that we use when they are very confused, is also a Turkish verbal ending that conveys the meaning of an unambiguous state of being or "is". In addition to this function, -dir is used to convey the meaning of "since" or that it has been a certain amount of time since something. This composition is another piece of sanat music, this time by Muzaffer İlkar, who spent decades writing classical music for Turkish radio and television. 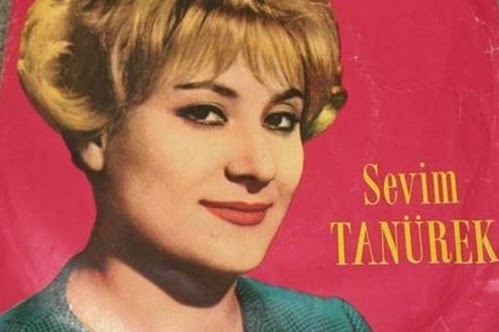 The performer is Sevim Tanürek, who performed for Turkish radio during the 1950s and went on to record a number of songs. She is also known for her sad and sudden death after being struck by a car crossing an intersection in Istanbul. The driver fled the scene but was eventually identified as Ahmet Burak Erdoğan, the son of current Turkish President Recep Tayyip Erdoğan, who at the time was the mayor of Istanbul. Tanürek died in the hospital a few days after the accident. Ahmet Burak was forced to pay a fine and settlement but did not go to jail. Senelerdir gözlerimden yüzün, kulaklarımdan sesin silinmedi. The love she has experienced is deep in the past, but as we learn through these lyrics, the traces of that love "have not been erased (silinmedi)" from her body after all those years. -dir - here to convey the meaning of "since" or "it's been (x time)"
Noticed how a -ki suffix is used to turn the phrase "in my heart (gönlümde)" into a word that modifies the following known "sevgin (your love)" to form the phrase "you love (i.e. my love for you) in my heart" (apologies for the backwards sounding sentences; I've written them that way so you can see how the grammar functions). The past is now prologue to our ongoing journey in the world of Turkish music, but it will never be forgotten. Before moving to Lesson 6: I Too Have a Heart, try matching this lesson's words with each other using the Scatter below.